Product Description For the determination of the closed cup flash point of petroleum products and other liquids having flash points below -30°C and 70°C inclusive. The Abel Closed cup flash point tester is used primarily to test flammable and combustible materials for shipping and safety regulations. Consists of test flame applicator, brass test cup, thermometer support, heating plate and electric heater. Applicator is precisely aligned per specifications and pivots for test flame application at specified temperature intervals. Hinged thermometer support raises to facilitate placement and removal of test cup. Adjust flame size using built-in needle valve and comparison bead. 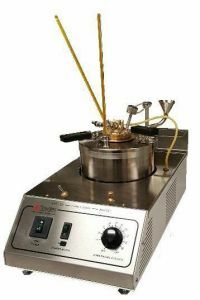 Equipped with a 400W nickel-chromium heater with stepless variable heat control for accurate repeat setting of temperature rate of rise per specifications. The unit provides a test range to 110°C and can be extended to -30°C by any appropriate external chiller (please request pricing if required).